Information sourcing is a vital part of man's behaviour.It is a fundamental human process closely related to learning and problem solving. These problems can only be solved when human beings have access to adequate, timely and accurate information. Most users are used to the manual based information sourcing system and find it difficult to adopt the modern ICTs sourcing patterns. 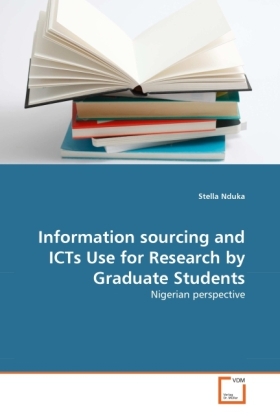 Some postgraduate students failed to realise that ICTs use enable various independent activities to combine and add value to product and service that stimulate innovation thereby leading to efficiency. All over the world,hundreds of billions of Dollars per year are spend on ICTs reflecting a strong global belief in the transformation potential of these technologies, for the Universities,certainly,ICTs have become essential.Therefore,this book provides strategies that could enhance effective information sourcing and carrying out a research work vis-a-vis information and communication technologies.The analysis should shed some lights on this research and should be useful especially to Library and Information Professionals,IT specialist,Researchers and to students in higher Institutions.